boutique trading strategies: Should You Use The Macd In Your Trading Strategy? Should You Use The Macd In Your Trading Strategy? The MACD indicator (or "oscillator") is a collection of three time series calculated from historical price data, most often the closing price. These three series are: the MACD series proper, the "signal" or "average" series, and the "divergence" series which is the difference between the two. The MACD series is the difference between a "fast" (short period) exponential moving average (EMA), and a "slow" (longer period) EMA of the price series. 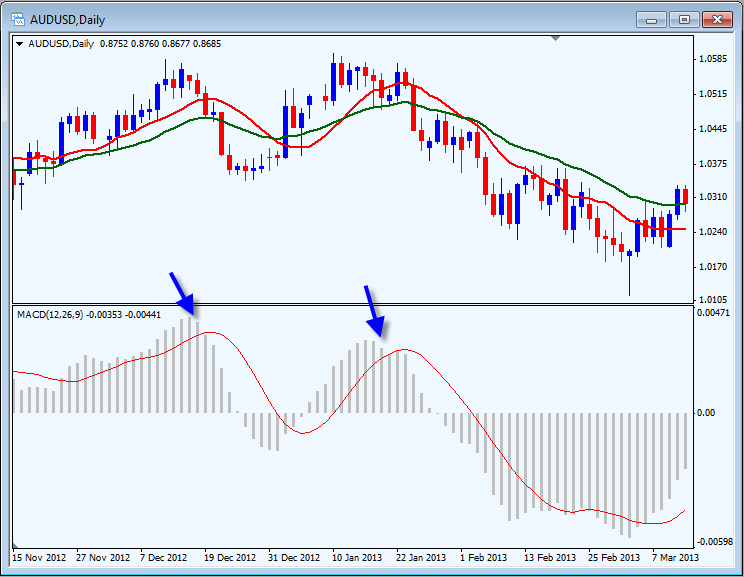 The average series is an EMA of the MACD series itself. The MACD indicator thus depends on three time parameters, namely the time constants of the three EMAs. The notation "MACD(a,b,c)" usually denotes the indicator where the MACD series is the difference of EMAs with characteristic times a and b, and the average series is an EMA of the MACD series with characteristic time c. These parameters are usually measured in days. The most commonly used values are 12, 26, and 9 days, that is, MACD(12,26,9). As true with most of the technical indicators, MACD also finds its period settings from the old days when technical analysis used to be mainly based on the daily charts. The reason was the lack of the modern trading platforms which show the changing prices every moment. As the working week used to be 6-days, the period settings of (12, 26, 9) represent 2 weeks, 1 month and one and a half week. Now when the trading weeks have only 5 days, possibilities of changing the period settings cannot be overruled. However, it is always better to stick to the period settings which are used by the majority of traders as the buying and selling decisions based on the standard settings further push the prices in that direction. 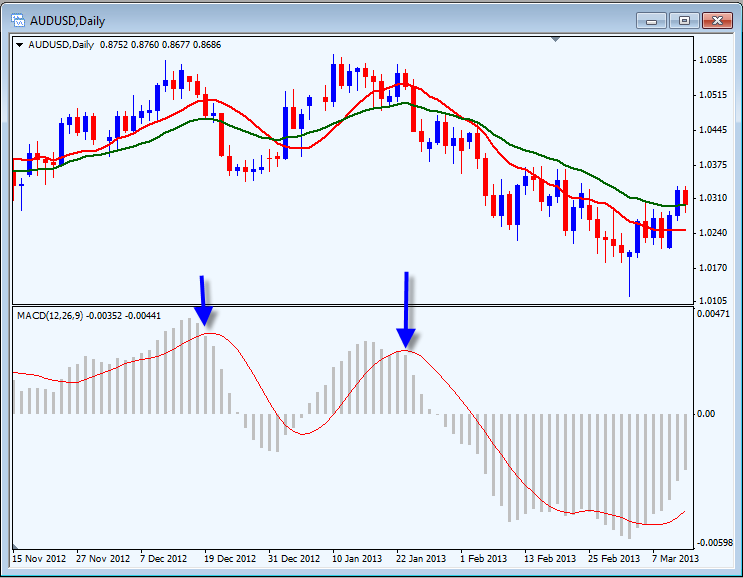 MACD is the very popular Moving Average Convergence Divergence indicator. It is a trend-following indicator developed by Gerald Appel in the 70's, during a very different market than we have today. The theory of MACD is that when two moving averages cross, a significant change of trend in the stock's price is more likely to occur. As with all indicators, the moving average crossover is not a "sure thing" and should not be considered an absolute truth as you trade stocks. Appel attempted to improve on that concept by using 3 Exponential Moving Averages to form 2 indicator lines. What MACD does is it plots the point spread between 2 different Exponential Moving Averages-a slower and a faster one. This is the first line. Then, a second Exponential Moving Average is plotted against the first. This is very similar to Stochastic. It can also be plotted as a histogram or bars, like Volume and Balance of Power are commonly used. This is how some people use the Macd to enter and exit their trades. You can see on the chart some arrows indicating entries and exits. Notice in the section where the price bars are, the arrows lag behind the crosses of the indicator. Often the indicator gives a signal well in advance of the price bars. There is one serious proviso, because of the length of the smoothing period on the indicator, a sharp adverse move in the price may not be reflected and there could be a loss incurred. Observing the bars in the histogram will allow the trader to detect changes in momentum and perhaps enter or exit his trade. The gap between the moving average lines will also be a guide to momentum. The Macd Indicator can be found on most charting platforms if not all. It is a widely used tool and there are several versions. People use their own version as to what reflects their individual needs. For purposes of this discussion we will use the standard settings of 12 26 9. 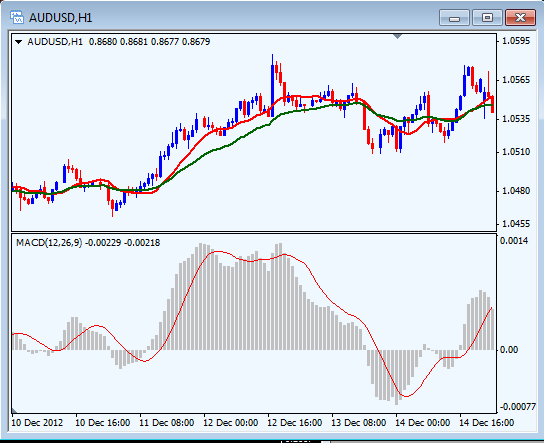 The Macd Indicator has a most useful function for the day trader or the longer term trader in that it can be used to identify and confirm the trend. It can also be used to measure the end of a range bound period. 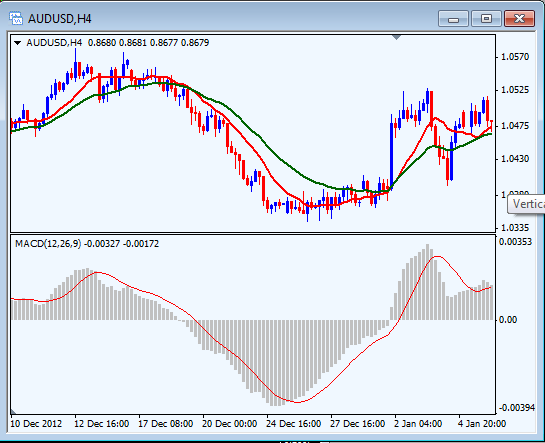 Traders have methods for trading with the trend and also within ranges, the Macd can help to illustrate the current market to help with decision making. This chart shows how we can determine a trending market or a ranging or non trending market. To further confirm as to what may be happening regarding trend, we can look at the next higher time frame also. Of course there are other methods of confirming trends such as moving averages or stochastics, for our purpose at this time we will look only at the utility of the Macd Indicator. A much Faster entry and exit using the Macd. How can I use the Macd to my advantage in trading? Most of the time a trader will be watching for a crossover of the lines to make entries and that has been a successful technique much of the time. By adjusting the lengths of the moving averages a person can make the entries much quicker than the 12 26 9 setup. By shortening the 26 to a lesser number, the indicator will be come much more reactive to price changes and allow for faster entries and exits. There is another way of using the indicator besides the crossovers. The histogram provides a signal, often well in advance of the crossover. You will notice that in a rising market the bars get longer and longer as the market advances and then they start to get shorter……. An entry signal. Conversely, as the market falls, the bars get longer and longer until they start getting shorter. A signal! 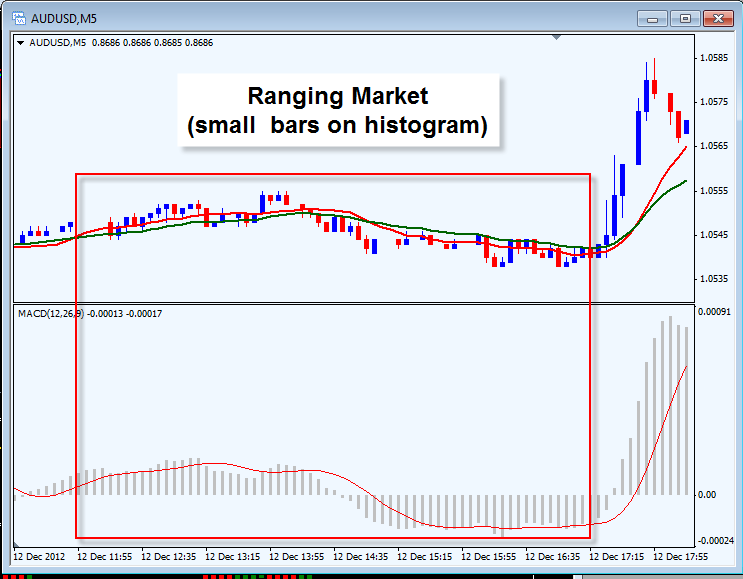 To use this type of signal we will have to observe the histogram bars as they move away from the zero line, going up or down and then keep an eye on the length of the bar. As soon as the bars begin to level off and get smaller, we have top be prepared for an entry or exit. Of course this is not a perfect technique, it is a guide only and must be confirmed with price action or perhaps a complimentary indicator such as volume. Here are a couple videos that are quite informative showing the Macd in action. This one is a bit older and still has effective methods. Enjoy your application of the Macd indicator and its uses! Do you have any suggestions or ideas as to how to use the Macd? I would love to discuss them with you.